Call now for our commercial air duct cleaning service and enjoy fresh air indoors! If you run a restaurant, or any other kind of business establishment that depend heavily on its ventilation systems, it can be vital to ensure your air quality is a good as it possibly can be. Having customer constantly spending long periods of time within your establishment is reason enough to ensure your environment is as comfortable as possible. With the added expectation that come with food and hygiene, letting your vents and air ducts go without professional attention can result in devastating consequences. 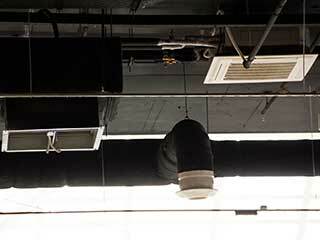 Air ducts and ventilation units all get increasingly dirty over time. Have yours cleaned by experts to ensure they run as efficiently as possible throughout the year. It is easy to underappreciate the level of dirt that can get caught in your ventilation systems. It isn't just pure air that gets absorbed, especially if your building hosts public audiences. Dead skin cells, human and animal hair, dust, dirt from the ground and all kinds of bacteria can be brought into your building on a daily bases. These substances can be carried by the air into your ducts, and there, they can become collected on filters, edges and various cavities within the frame of your units. The bacteria from this dirt can develop into more if it is left without proper cleaning. When a ventilation or HVAC unit is dirty, it gets blocked. When it is blocked the air passes through it less effectively and its performance is dampened. Leave it for long enough, and blockages can start to damage the air quality that is then fed back into your rooms. Having the system cleaned often means it is restored to its original performance capabilities. If you are interested in having commercial air duct cleaning services for your property call us today to get a fast quote and to arrange a call out. One of your highly trained technicians can come and perform an assessment of your needs and circumstances, before outlining the methods we can apply to help you.